If you suffer from poor sleep, you should know that Cognitive Behavioural Therapy for insomnia (CBT-i) has been demonstrated in randomized clinical trials to be the most effective treatment available for insomnia. What is insomnia and when is it considered chronic? 1. Trouble falling asleep, waking up too early in the morning or waking during the night and being unable to fall back to sleep. 2. The sleep difficulty occurs at least three nights per week. 3. The sleep disturbance causes clinically significant distress or impairment in social, occupational or other important areas of functioning. Insomnia is considered chronic if symptoms persist for three months or more. What is CBT-i (Cognitive Behavioural Therapy for insomnia)? 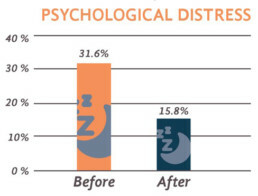 Most people suffering from insomnia have a very unpredictable sleep pattern. They live with the uncertainty of what the night will hold for them, compared with good sleepers, who can rely on their sleep being stable and satisfying. Cognitive Behavioral Therapy for insomnia, also known as ‘CBT-i’, can improve your sleep by helping you identify and change the thoughts and the behaviours that affect your ability to sleep well. 1. Address the mental (or cognitive) factors associated with insomnia, such as a racing thoughts going through your head. Replace behaviours that over time have reinforced poor sleep habits with new behaviours that restore good sleep. 2. Optimize your sleep routine to create a strong, positive connection between your bed and high quality, restful sleep. Falling asleep and staying asleep become more automatic and natural. 3. Improve your chances of achieving reliable sleep, night after night. What are the benefits of CBT-i? When you don’t take care of something as fundamental as sleep, it only makes sense that eventually there will be physical, mental and emotional consequences. If you are a poor sleeper, better sleep will help you manage the stresses and strains of daily living and be more organized and in control of your life. 1. 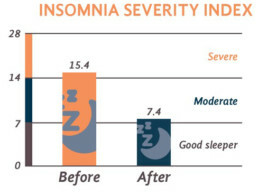 A significant decrease in the severity of insomnia symptoms. In other words, you fall asleep faster and stay asleep longer, with fewer awakenings during the night. Overall sleep quality and satisfaction with sleep are also significantly improved over the course of treatment. 2. Sleeping better can have a significant impact on daytime functioning, including improved mood, energy levels, motivation, as well as enhancing the ability to concentrate and to get things done. 3. You may not know that many clinical studies have demonstrated that successful CBT-i treatment can reduce the severity of symptoms of depression and anxiety, and can help reduce one’s reliance on hypnotics (sleeping pills) or other psychoactive drugs (including alcohol and cannabis) used for sleep. 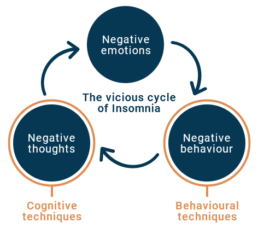 CBT-i is an ‘evidence-based therapy’, meaning that it has been shown to be effective in controlled scientific clinical studies. Clinical research has long shown that CBT-i can teach people how to fall asleep faster, stay asleep and feel better during the day. During the last 25 years, thousands of insomnia sufferers have participated in large-scale, randomized controlled trials comparing the effectiveness of CBT-i to pharmacotherapy (prescription medication used to get to sleep), sleep hygiene information and placebo (no treatment). These trials have clearly demonstrated that CBT-i is the most effective treatment available for insomnia, and that 60%-70% of people, including those with severe chronic insomnia, obtain lasting benefit from the treatment. Clinical research has also shown that poor sleepers generally would prefer a practical approach based on CBT-i compared with taking sleeping pills. In fact, the evidence shows that CBT-i helps most people achieve sustained long-term improvements in their sleep, whereas the effects of medication or other pharmacological sleep aids are mostly short-term. The results are so compelling and consistent, that major healthcare advisory bodies in Canada, US and Europe advocate CBT-i as the preferred treatment for adults suffering from insomnia. Click here for a list with links to some of the most recent advisory body recommendations for chronic insomnia in adults. Who can treat insomnia using CBT-i? In Canada, CBT-i should be delivered by a therapist who is provincially licensed to perform psychotherapy and who has received specific training on treating insomnia clients with CBT-i. This includes medical doctors, psychologists and, depending on the province, other practitioners such as social workers and psychotherapists. The therapy generally occurs in a clinic and takes place in weekly sessions over the course of 6 to 8 weeks. However, a significant barrier to treatment is that few therapists are trained in CBT-I, and those therapists who are trained often have limited availability. Furthermore, seeing a therapist in clinic often requires a significant amount of commuting at times of the day that may not be convenient, especially for someone with work and family responsibilities. Commuting may not even be an option for those who live outside of Canada’s big cities. What makes HALEO’s CBT-i different? HALEO’s mission is to make screening, diagnosis and treatment of sleep disorders more accessible. To do so, we are constantly working to improve access to treatment. 1. Increasing the number of therapists trained to practice CBT-i Finding a therapist trained in CBT-i who is available and operates close to where you work is a challenge for many people suffering from insomnia. Our clinical experts are training and coaching large numbers of experienced, professional therapists to practice CBT-i. To date we have trained over 20 therapists in Québec and Ontario, but our goal is to be able to provide our service in every Canadian province as soon as possible and without a waitlist. 2. Making therapy easier to access. Let’s face it, when you’ve been having trouble sleeping and you’re stressed and feeling constantly fatigued, it’s not easy to carve out an additional 1-2 hours every week to commute to a clinic. HALEO’s therapists deliver CBT-i entirely through live videoconference sessions on a digital platform. Our therapists can serve any client with access to high-speed internet and a web camera, no matter where they live within the province. Already we have successfully treated many clients with busy schedules or who live in remote areas. 3. Reducing the cost and length of treatment. We have worked to make the cost of treating insomnia more accessible. Generally, CBT-i lasts 6-8 weeks and costs up to $1200, depending on the number of sessions indicated and the hourly fees charged by the therapist. HALEO’s experts have developed a briefer version of the treatment with shorter weekly sessions, while maintaining the clinical effectiveness of in-person CBT-i. HALEO’s digital platform reduces therapist time spent on administration and reporting, which allows the therapist to focus her time entirely on helping you, the client. Does HALEO’s telehealth version of CBT-i give the same results as in-clinic CBT-i? In 2017, over 1500 employees from Desjardins, one of Canada’s largest financial institutions, participated in HALEO’s Healthy Sleep Program by completing a confidential online sleep disorder screening questionnaire. Employees who received a result that included a risk notification for insomnia were 4x more likely to be suffering from moderate to severe symptoms of a mood disorder. Many of those employees chose to connect with HALEO to treat their insomnia. Of those employees who completed treatment, 89% saw a significant improvement in their sleep, as measured by the Insomnia Severity Index, a questionnaire commonly used in clinical practice to evaluate insomnia symptoms. In other words, nearly 9 of 10 clients who completed treatment went from severe insomnia to good sleeper, severe to moderate insomnia, or moderate insomnia to good sleeper. If you or someone you know is in distress, DO NOT use this site. Call 911.